Leeds were forced to settle for a point despite dominating against Everton. Wayne Rooney marked his return after suspension by giving Everton a 12th minute lead with a sweet 20-yard drive. Tomasz Radzinski hit the woodwork seconds later, but Leeds were then kept at bay by a succession of stunning saves from former keeper Nigel Martyn. Relegation-threatened Leeds deservedly equalised in fine style from James Milner after 50 minutes with a clever finish, but could not fashion a winner. Everton restored Rooney in attack alongside Radzinski - and the England teenager had a swift impact. Radzinski should have put Everton ahead after seven minutes when he raced clear on to Tobias Linderoth's pass, but his shot was turned aside by Paul Robinson. But Everton were ahead five minutes later thanks to a trademark strike from Rooney. Leeds failed to clear a corner, and when Steve Watson found Rooney, he drilled home a fine 20-yard finish. And Everton were denied a second goal by an upright in their next attack when Radzinski beat Robinson and hit the woodwork, with Michael Duberry making a fine block to stop Rooney converting the rebound. It was the turning point in the first half, with Leeds finally finding their feet and laying siege to Everton's goal. And it was former Elland Road hero Martyn who kept his old club at bay. He made a brilliant one-handed save from Milner's curling shot after he spotted the goalkeeper out of position. And Martyn repeated his heroics eight minutes before the interval when he turned over Smith's shot from 20 yards as it seemed destined for the top corner. Martyn was at it again four minutes into the second half to halt Viduka, but Leeds were rampant and deservedly equalised after 50 minutes. Viduka was the creator, laying the ball into Milner's path for the youngster to stroke a left-foot finish inside Martyn's post. And Milner should have put Leeds ahead seconds later as he was blocked just yards from goal. Martyn was having a magnificent night, and Smith was left cursing again when he made another fine save after 70 minutes. Everton's best effort came from a 35-yard shot from substitute Alex Nyarko that was only narrowly off target. 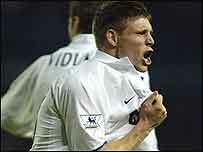 Leeds: Robinson, Kelly, Caldwell, Duberry, Harte, Pennant, Radebe, Matteo, Milner, Smith, Viduka. Subs Not Used: Carson, Barmby, Olembe, Lennon, Simon Johnson. Everton: Martyn, Pistone, Yobo, Unsworth, Naysmith, Watson (McFadden 55), Gravesen (Carsley 80), Linderoth (Nyarko 55), Kilbane, Rooney, Radzinski. Subs Not Used: Wright, Hibbert. "Leeds will feel that they did enough to win it"
"We were unfortunate not to win the game the game"